What does a great day hiking look like? What elements, if included, make it a great hiking day? Well, it would need to have great views, include a stop at a store, a shower, wash your clothes, eat a meal at a table like a civilized person, challenging trail, route finding, oh and poop on a real toilet. If you have any three of these then it is a great hiking day. What if you have all of them? It's a super-duper, totally excellent hiking day, of something. That was today. Rather than hitchhike into Idylwild, I decided to hike the unofficial Mt Fire alternate. Boy I am glad I did! Not only do I have a contiguous set of footsteps from the border, I had all of the stuff above happen too! What an eventful day. I am only about three miles back from where I planned on finishing prior to knowing about the Mt Fire closure. Tomorrow is looking like a day for the record books if all goes well. I want to make it to Ziggy and The Bear's tomorrow which will make tomorrow a thirty two mile day. 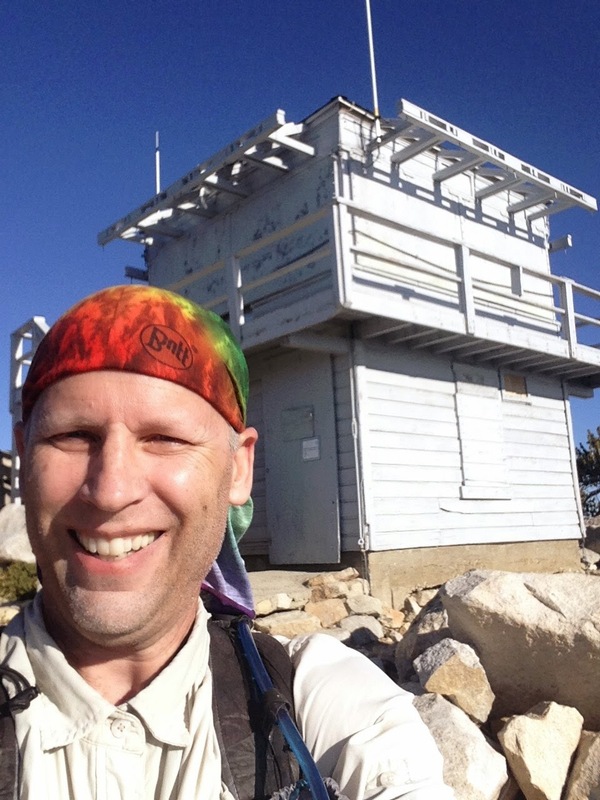 The toughest and most exhilarating thing that happened today was making it to the top of Tahquitz Peak to the fire lookout. It was a long climb that began right after lunch and went on and on and up and up, switchback after switchback. Not only is it a physical challenge it's a mental one too. I can't allow myself to celebrate until I reach the top. If I even begin to feel excited, that's it, disapointment and despair set in when I realize there is more to go. I keep telling myself, "this trail goes on and on for ever, just take another step." By the end I had burned through all of my snacks and was running on shear will and desire alone. My body is my slave it will do what I want no matter how tired it is. No matter the pain, just keeping drinking water. One more step. Reach high it's a big rock, turn the corner, keep going, don't stop breath in breath out, consistent step, go, go. Mentally I play that tape over and over for five hours and a couple of thousand vertical feet. I did it! Yes!